The author went on to recount how her husband, who was a complete novice to trading was making money from it most days and that some people fund there holidays entirely through trading profits.I’m not going to deny that the latter isn’t possible; with interest earned on a sufficiently large sum of money it most certainly is. However, accounts such as these overemphasise the ease with which money can be made from online trading and reliability of it as passive income stream. When I was wet around the ears, I would read statements like this and begin to extrapolate. The line of reasoning of course, was that if a beginner almost profits everyday then surely someone experienced could make profit every day. In reality, trading is a very difficult activity to profit from, especially when the time frame is shorter and we begin to look at things not in terms of years or months but days or hours. Still the question remains; although this may seem a very naive expectation, is it actually even possible? One seemingly consistent way to profit from trading everyday would be through insider trading. Putting aside that this both unethical and illegal from a trading perspective, it also requires access to private information not available in the public domain. One could reason that securities that are traded with high volume that represent large entities such as currencies and large companies are far less likely to be susceptible to inside trading. I would argue this on the grounds that they are more heavily regulated and that the volumes with which they trade it would require concerted manipulation from a party of extremely wealth entities or individuals. It is however possible that a specialist with private knowledge of small companies could trade with inside information for profit. I, like probably almost anyone reading this blog post lack this sensitive information to accomplish this in the way that Gordon Gecko can. Even if I did have access to it, I would only be making almost guaranteed profit at certain specific times, such as before price sensitive announcements (which don’t happen daily anyway). So profiting every day from trading may prove to be difficult even through illegal means let alone using a legitimate system which isn’t rigged in our favour. Beating the market in more ways than one – the world of high frequency trading. It is no secret that the financial markets are wrought with corruption; there are numerous documentaries on the 2008 financial market collapse that highlight this fact. The financial markets aren’t a level field and those at the top tier of the industry such as banks and large hedge funds are at a significant advantage compared to the average market participant. How do they get such an edge you ask? The most common means is through high frequency arbitrage trading. The concept of arbitrage in commerce is probably ancient. It’s basically just an exercise in being a opportunistic middleman. I’ve heard of people using Ebay or Amazon or other eCommerce websites to flip goods for a profit differential as a hobby or even make a living through this kind of activity. This type of flipping transaction is in essence just a form of arbitrage. In the context of high frequency arbitrage trading the operation is far more sophisticated and requires deep pockets and extensive resources to even begin with. Hence, it is basically inaccessible to the average investor such as you or myself. Putting that aside, just how is it done and how profitable can it be? Let’s say that there is a big order for stock X which is trading on the exchange. This will create an imbalance in supply and demand and will boost the price of stock X temporarily. At another exchange, the price of the stock may still be at the original price. For certain market participants, they can now buy the stock at the lower price on the second exchange and sell it for the higher price on the first one. High frequency trading just attempts to exploit the small delay in information transfer through the vast network of the financial markets. It’s termed ‘high frequency’ because trades like this are typically done hundreds or thousands of times per day ( or even second!) and the positions lasts only fractions of a second. This is a perfectly legitimate method of profiting and is even encouraged by large exchanges because it promotes market liquidity and stability. In fact, those engaging in this practice are often paid a commission by the volumes that they trade at. The main players are large hedge funds, and they’ve been aptly given the name, the ‘flash boys’ by industry pundits. This is a term coined by Michael Lewis in his book of the same name where he explores this form of trading in depth. Perhaps the most successful and prominent of the flash boy traders is John Simmons. He is a legend of the hedge fund industry and a brilliant mathematician. 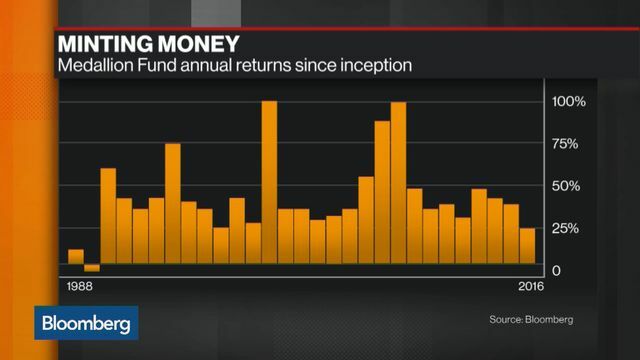 Through employing an army of the finest math PhD’s his hedge fund, Renaissance Technologies has managed to amass ROI’s far exceeding the market index. In fact, even after the considerable management fee the fund charges the returns exceed the market by quite a long stretch. Obviously arbitrage isn’t as simple as I have made it so far seem; the fact that Renaissance Technologies requires the mathematical expertise of a team of exceptional individuals shows that it is considerably difficult and profits aren’t so easy. There are many other big hedge funds and even banks which a team dedicated to similar trading activities and they are all competing in the arbitrage field against one another. So do they make a profit every day? I remember reading that the NAB bank of Australia, through its arbitrage trading activities had profited on almost every day of the year and only on several days had it reported a loss. I suppose that arbitrage is quite like any other form of trading and each arbitrage strategy employed has its own level of statistical success and deviation. Can arbitrage taken to the extreme make a profit every day? Possibly but its’ still very difficult even with a deep pockets, extreme computing resources, mathematical experts and a very low latency connection as close as possible to the stock exchange. Having said the flash boys beat the market quite substantially and unlike the market indices are consistently able to profit on a year on year basis. They beat the market in performance through beating the market in transaction speed. At this point you should be realising that to profit every day ( for a small retail trader at least ) is practically impossible over a reasonable time frame. You may experience instant gratification and profit in your first few days on every single day as you begin your foray into trading, but this is unlikely to continue. As I touched on earlier, trades like many other things in life are statistical and profit is never guaranteed –any trade strategy must have an average and a deviation. To consistently make above market average returns year on year is quite an accomplishment in itself and a much more realistic goal. Considering that most fund managers, who are paid to watch the markets and invest people’s money in the market to make profit actually underperform the market indices highlights this. The prime reason why the flash boys are able come pretty close if not achieve this is because they make a staggering number of trades per day. So many that the long term average – which is that they make a solid return is pretty much realised over a single day period. The deviations of their strategy are essentially smoothed out the greater the number of trades. Mathematically it can be shown that trading on short intervals creates a greater disadvantage compared to trading long-term, but our desire for instant gratification and lack of patience temps us towards the former. When it comes to the financial markets trade long-term, like an investor and you will achieve far greater results. Don’t worry about the individual days, look at the big picture and what happens over years. It would be comforting to know that everyday we can profit from the financial markets but this just isn’t a realistic expectation.